In our world of 24/7 media, where we seem to hear about the next big cure, important dietary change or very dangerous drug virtually every day, it is hard to believe that the news people, tweeters and bloggers could miss anything that is going on in health care today. However, it appears most everyone missed a big one. There was no mention in the New York Times, Wall Street Journal, Washington Post, etc. Only US News mentioned this by repurposing material from Health Day. The government, through the FDA, plans cut health care costs by eliminating the need to see a doctor and shift the costs of medications to the patient. And you should be afraid ... very afraid!!! What I am referring to is a public hearing that was held on March 22 and 23, for which the hearing notice was placed online only a few weeks before, on February 28. The meeting was titled "Using Innovative Technologies and Other Conditions of Safe Use To Expand Which Drug Products Can Be Considered Nonprescription." What was the purpose of such a meeting? According to the briefing document: ""The U.S. Food and Drug Administration (FDA or the Agency) is announcing a public hearing to obtain input on a new paradigm we are considering. Under this paradigm, the Agency would approve certain drugs that would otherwise require a prescription for nonprescription use (also known as over-the-counter or OTC) under conditions of safe use. These conditions of safe use would be specific to the drug product and might require sale in certain pre-defined health care settings, such as a pharmacy." You have to read between the lines here, but essentially what this is saying is that the FDA is thinking about a completely new way to approve or classify drugs, so that some drugs if dispensed in a pharmacy would be allowed to be purchased over the counter/without a prescription. "Undertreatment of many common diseases ... is a well-recognized public health problem ... The requirement to obtain a prescription ... may contribute to undertreatment of ... hyperlipidemia (high cholesterol), hypertension (high blood pressure), migraine headaches, and asthma. For instance, some consumers do not seek necessary medical care... because of the cost and time required to visit a health care practitioner for an initial diagnosis and an initial prescription. Some patients who obtain an initial prescription do not continue on necessary medication because they would need to make additional visits ... Some prescription medications require routine monitoring through the prescribing practitioner such as blood tests ... FDA believes that some of these visits could be eliminated by making certain prescription medications available without a prescription but with certain other conditions of safe use that would ensure they could be used safely and effectively without the initial involvement of a health care practitioner ... In addition to improved health outcomes ... Eliminating or reducing the number of routine visits could free up prescribers to spend time with more seriously ill patients, reduce the burdens on the already overburdened health care system, and reduce health care costs. Now, on the surface, this might sound like a good thing. Wouldn't it be great if we could find easier ways for patients to get their needed medicines? After all, as our nation gets older (and more overweight), chronic diseases are going to be main issue in health care. It is all about improving health, right? Unfortunately, the bottom line here is that instead of finding a real solution to improving access to primary care physicians or finding real ways of reducing health care costs, the government (through the FDA) has come up with a simple plan: take the doc out of the picture and shift costs to the patients. The fact of the matter is that though medications are expensive, they only represent about 10 cents of every dollar spent. The two biggest costs are doctors and hospitals. Thus, if we are trying to cut costs, the most economical solution would be to eliminate or at least curtail a visit to the doctor. Since prescription medications require a prescription, which requires a doctor's visit (or at least phone call), the FDA can just make certain medications available over the counter and we no longer need those annoying, inconvenient, and expensive visits to your primary care provider. Now there are already lots of medications available over the counter. These medications are considered safe enough to use, and a medical degree is not required to figure out that you take cold medicines for your cold and heartburn medicines for your heartburn. However, what the FDA is talking about are medications to treat chronic diseases like asthma, high blood pressure, high cholesterol and though not mentioned, probably diabetes. It was only back in 2005 when the FDA rejected Merck's bid to make their cholesterol medicine Zocor (simvastatin) over-the-counter. At that time, they knew that even drugs that seemed relatively safe and could benefit many people required expertise to properly diagnose and treat high cholesterol safely and effectively. More recently, Pfizer also tried to get their patent expiring Lipitor to be sold over the counter (see my post Why OTC Lipitor is a Bad Idea). How can medicines that were only a few years ago considered too dangerous to be taken over the counter, would now be considered safe? According to the briefing document: "The conditions of use could include requiring pharmacist intervention to ensure appropriate nonprescription use. Additionally, conditions of safe use could involve the use of innovative technologies, such as diagnostics approved or cleared by FDA for use in the pharmacy or other setting." In other words, for certain (particularly expensive) chronic diseases such as asthma, high blood pressure and high cholesterol; the FDA would consider these medications safe by allowing the pharmacist, not the doctor, to determine which medication is right for you. And if you needed any blood work, the FDA might clear the way for this to be done in the pharmacy as well. But my favorite part is about the kiosks: "For example, kiosks or other technological aids in pharmacies or on the Internet could lead consumers through an algorithm for a particular drug product." Can you just imagine patients going up to an ATM-like machine, entering their conditions, allergies, blood levels, etc. and having the computer spit out exactly what dose of what medicine that they should be taking for their high blood pressure or high cholesterol? 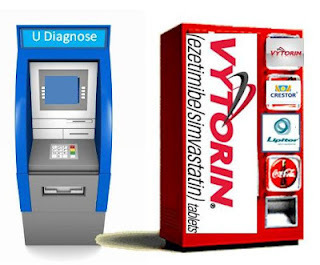 Would there be a soda-like machine right beside it that could dispense the appropriate medication? I have nothing against pharmacists. I value pharmacists as part of the health care team. In addition, I feel their role is substantially underutilized. Part of the problem with chronic disease is adherence to medication, a large part which has to do with education. Pharmacists are experts when it comes to informing patients about their medications, how to take them properly and why taking them is necessary. They can monitor adherence to medication and can also serve on the front lines to alert physicians if their patients aren't doing well and need closer attention. However, when it comes to making a diagnosis and determining which therapy is best, pharmacists do not have the depth and breadth of training that physicians receive. As a primary care physician, I can tell you that even the most common conditions like asthma or sinusitis is not always that easy to diagnose, and even determining treatments for these conditions do not do well with cook book like algorithms. Another concern I have with pharmacist essentially prescribing medications is that they are employed by the pharmacy that dispenses these medications, and thus have a potential direct conflict of interest. Now, I am sure skeptical readers will say that drug reps have been given physicians gifts and samples for years, and this is conflict as well. Though this may be true, a pen or a slice of pizza is a whole different level of conflict then direct money in your paycheck. Also realize that the pharmacy makes a bigger profit on generics, thus the pharmacist may be consciously or unconsciously biased to give you a generic when it may not be the best choice. Usually when a drug goes OTC, it usually means the patient has to pay more. This is because most insurance programs do not cover over the counter medications. Ask any patient who suffers from seasonal allergies. OTC non-sedating antihistamines like Claritin, Zyrtec, and Allegra cost a lot more out of pocket, even when using the store brand, then when they were available by prescription. This is because the out of pocket cost for co-pay for a preferred drug (even when branded) is often less than the out of pocket cost for an entire supply of over the counter medication, even when generic/store brand. What's most shocking to me is the lack of dialogue on this topic. My guess is that this may be due to lack of awareness, since the FDA seemed to slip this past the media. Physician representation at the March hearing was pretty poor. Few groups such as The America College of Physicians seem to be interested (or aware). The AMA did testify at the hearing, and according to their website: "While the increased availability of certain prescription-based antidotes, such as Epi-Pens, appear to have few if any safety concerns, the FDA has not offered evidence that patients with hypertension, hyperlipidemia, asthma, or migraine headaches can self-diagnose and manage these serious chronic medical conditions safely on their own. This sort of self-diagnosis and treatment conflicts with the kind of care coordination and disease management that both the administration and private sector are trying to achieve through the new health care payment and delivery models." To me the "conflicts with ... new health care payment and delivery models," is very interesting. This suggests to me that the government is trying to hedge their bets. In other words, if the new plans for health care reforms don't work, we can still lower cost and increase access simply by making many chronic disease drugs over the counter. Most commentary that can be found on this issue seems to be coming from the pharmacist groups, who are, not surprisingly, supportive. However, there is at least one pharmacist that remains skeptical. Pharmacist blogger Eric Durbin at his blog Eric, Pharmacist states: "I've never known our government or any of its agencies to move quickly on issues, especially when it comes to our profession. But for this issue, the notification for the hearing was filed on February 27, published in the Federal Register on February 28, with a deadline to present oral comments & presentations of March 9. That's less than two weeks. With the hearing being held less than two weeks after the deadline. 3-1/2 weeks from the notice of hearing in the Federal Register until the hearings begin seems to be moving rather quick to me. Which makes me skeptical"
Bottom Line: Though this may seem like an initiative that could improve patient access and chronic disease outcomes, allowing chronic disease medications to be over the counter is a way the government can cut health care costs by eliminating expensive doctor's visits and shift medication costs to patients. In addition, you can send this post to those who know who might care about this issue and/or write your own post. You can Tweet, post to Facebook, etc. Social media has done wonders recently in getting the word out and making changes. However, time is of the essence.